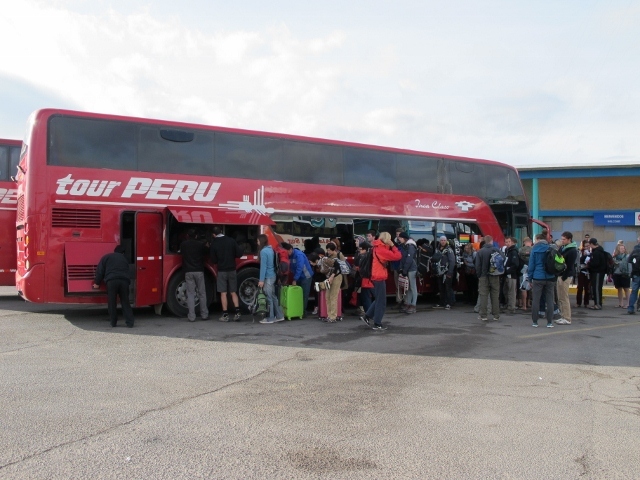 We took the bus along Lake Titicaca to cross borders between Peru and Bolivia. On the way we met a German traveler, Karin, who had taken one year off to work for the NGO she was supporting since a few years. Being part of the team in Peru she had to find out that her money did not go where she thought it would and that the reality on location was different form the publications of the organization back in Germany. Her biggest concern was that while the NGO’s goal is to help poor communities they refuse to pay fare salaries and social benefits to their local employees. Therefore she decided to quit and start her own NGO with 2 locals she met during her stay! Her concept is, to have the NGO run by the locals and make sure that besides doing a great job for the communities they are working with to also provide fair salaries and benefits to the 2 employees so they can improve their own lives and the future of their kids. She will coordinate the cash flow from Europe while working in her old job to not be part of the NGO’s budget. We’ll stay in touch to follow her story. Below a few photos from our stopover in Copacabana/Bolivia and our bus crossing Lake Titicaca at Estrecho de Tiquine.